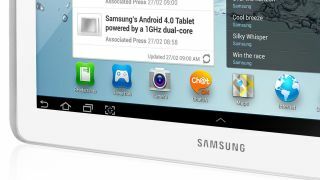 Samsung squaring up to 12-inch iPad with its own super-sized tablet? Following rumours that Apple is working on a super-sized, 12-inch iPad, Samsung is said to be making similar plans of its own. Samsung is plotting to bulk up, according to supply chain sources, with 12-inch or larger tablet displays in the works that will lead us into a brave, bigger new world. The sources cite the the drop in global tablet shipments as part of the reason for a shift into a plus-sized market, hoping to move us away from the idea that our slabs should be heading in the other direction. So the South Korean company is going up against notebooks instead of smartphone-cannibalising phablets - a move it clearly sees as reaping more benefits in the long run. This could mean demand for conventional notebooks starts to feel the burn, but only if Samsung and Apple are right to bet on people wanting larger tablets. Talk of a 12-inch slate actually came a few weeks ago via @evleaks, who posted the specs of two Samsung tablets, one 10-inch and 12.2-inch, that Samsung is reportedly at work on. At around the same time, court documents surfaced revealing that the company was working on a tablet codenamed the P10 that measured 11.8 inches and would offer up a retina display. That's all well and good, but what do we think of the small contenders on the tablet market right now?